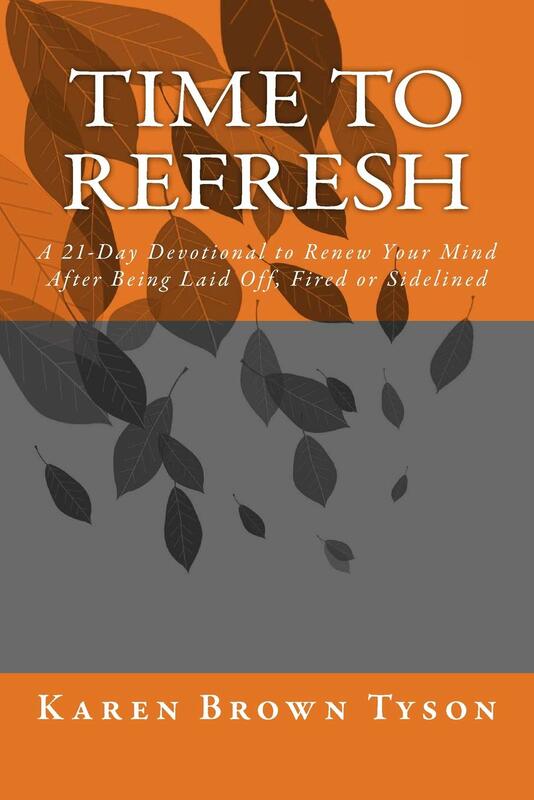 Time to Refresh is available to purchase on Amazon, Barnes and Noble, and IndieBound. To win a copy of the book Time to Refresh by Karen Brown Tyson, please enter via Rafflecopter at the bottom of this post. Giveaway ends December 3rd at 12 AM EST. We will announce the winner the same day on the Rafflecopter widget. Good luck! WOW: First of all, congratulations on the launch of your book Time to Refresh! What led you to write this book? Karen: On November 1, 2017, I found out I would be without a job in 60 days. Because I experienced layoffs two other times in my 25-year career, I was determined to be as productive, focused and positive as I could be during my time away from a traditional job. My motivation in writing the book came because I wanted to prove to myself and others that being laid off is not the end of the world. I also wanted to share my story with others sitting on the sidelines of life. WOW: Being in that boat myself (of sitting on the sidelines) at the moment, I love your motivation to write this book! Between your successful public relations business, your writing career, your work within your church and raising a family, you handle so much! How do you handle all of this while still making time to write? Karen: Lots of organization and planning! Also, I am an early bird. I get up between 4 and 5 a.m. during the week. By 11 a.m., I have at least two hours of writing in, along with my morning workout, and a trip to the bus stop. WOW: That's an impressive morning routine! That leads me to my next question - what advice do you have for writers who keep telling themselves they don’t write because they don’t have the time? Karen: How we view and manage our time requires a shift in mindset. We all get the same number of minutes every day. One of our most valuable assets is time. Yet, we allow people and situations to steal our time. How we, as writers, see and use our time is up to us. If you dream of writing a book, you will need to manage your time. WOW: I completely agree! Time is incredibly valuable and we must treat it that way. I couldn’t help but notice on your website you coach writers. How does coaching writers also help you with your own writing? Karen: Coaching writers and aspiring authors is great because it allows me to understand what they want to accomplish with their writing projects. From there I research new ideas and recommend strategies for their books, which sometimes, works in promoting my book. WOW: I love how you are able to work in promoting your book with your coaching. So, what was a lesson you learned along the way in writing this book that challenged you and changed you? Karen: Writing a book takes time. The lesson I learned is that it’s my job to make time to write and see my books come to life. WOW: Absolutely and that's an ongoing lesson for me too. What are you working on now? What is next for you? Karen: I have two manuscripts in the pipeline. The first book is called, Change for His Glory, which explores how a Christian’s response to change can and should bring glory to God. The other book I’m working on focuses on how business writers can change their mindset and behaviors to improve their writing. WOW: I'm looking forward to reading your next books! Thank you for chatting with us today and best of luck with Time to Refresh. Be sure to stop by Anjanette's blog where you can read Karen Brown Tyson's guest post on managing career, home, and ministry. Visit Rozelyn's blog where you can read her review of Karen Brown Tyson's book Time to Refresh. Visit Jonelle's blog to read what she has to say about Karen Brown Tyson's book Time to Refresh. Visit Beverley's blog where Karen Brown Tyson talks about how to improve your writing life. 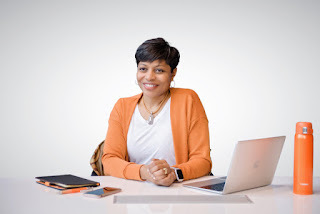 Stop by Erik's blog where you can read Karen Brown Tyson's blog post about how to build your personal brand. Stop by Jill's blog today where you can read Karen Brown Tyson's blog post about how to improve your writing life. Visit Beverley's blog again where she shares her thoughts about Karen Brown Tyson's book Time to Refresh. Visit Anjanette's blog again where she interviews author Karen Brown Tyson about her book Time to Refresh. Visit Deirdra's blog where you can read Karen Brown Tyson's blog post about fearless writing. Stop by Peggy's blog to read author Karen Brown Tyson's post about journaling and stress management. Visit Kathleen's blog where you can read Karen Brown Tyson's blog post about fearless writing. Visit M.C. Walker's blog where she interviews author Karen Brown Tyson about her and her book Time to Refresh. Visit Wendi's blog where you can read Karen Brown Tyson's blog post about having faith during difficult times. Visit Jessica's blog where you can read her thoughts on Karen Brown Tyson's book Time to Refresh. Visit Louise's blog where she shares her opinion on Karen Brown Tyson's book Time to Refresh. Visit Margo's blog where you can read Karen Brown Tyson's blog post about parenting. Visit Wendi's blog again where you can read her opinion about Karen Brown Tyson's book Time to Refresh. Visit Lily Shadowlyn's blog where you can read Karen Brown Tyson's blog post about journaling. 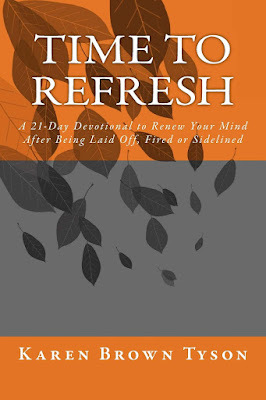 Visit Nicole's blog where she shares her thoughts about Karen Brown Tyson's book Time to Refresh. Be sure to stop by Margo's blog again where you find out what she had to say about Karen Brown Tyson's book Time to Refresh. Visit Lacey's blog where you can read Karen Brown Tyson's blog post about journaling. Stop by Lacey's blog again where she reviews Karen Brown Tyson's book Time to Refresh. Be sure to visit Rozelyn's blog again where you can read Karen Brown Tyson's blog post about change management. Keep up with the latest blog tours by following us on Twitter @WOWBlogTour. To win a copy of the book Time to Refresh by Karen Brown Tyson, please enter the Rafflecopter form below. Giveaway ends December 3rd at 12 AM EST. We will announce the winner the same day on the Rafflecopter widget. Good luck! Karen ~ I love that you turned your experience of being laid off into a positive! Your book sounds inspiring and much needed. I also find my most productive writing time to be in the early morning. You are so right about how viewing your time in the right mindset can make a huge difference. I participated in NaNoWriMo this year for the first time, and I'm almost done. My writing has never been this productive, and I think it all comes down to giving myself the permission to make writing a priority. Thanks for sharing your thoughts. :-) My decision to make writing a priority in my private time has made a huge difference. I love NaNoWriMo and I am so glad you gave it a try. Congratulations on your accomplishment! I look forward to reading the fruits of your labor. Nicole--You were the perfect person to do this interview. Thanks for doing it. Karen--One statement you made was so simple and yet so powerful. You said, "It’s my job to make time to write and see my books come to life." Some may put the emphasis on "job" but it was like an arrow hitting a target when I read it, because I put the emphasis on "my." It's MY job to make time to write and see my books come to life. It's all up to me. It's all up to each of us to make it happen. If we sit still and do nothing, nothing will happen. None of our dreams will come true. Good luck with your other two manuscripts. It sounds like your current "baby" will help bring hope to people who desperately need some encouragement and strategies to get their lives back on track. Thanks so much for your insight. You are so right to take ownership of your writing and where the real responsibility lies. I totally agree. Wishing you all the best on your writing journey. What a lovely interview! As another NaNoWriMo-er I always marvel every November how I shift my schedule around. I areally appreciated hearing the sentiment that everyone is given the same number of minutes. I 100% agree, congrats on the book! It's great to see how motivated she was to not stand by when getting laid off. She didn't just let it happen to her. She turned that into something positive. During such a time it must be great to draw strength from the Bible. Thanks for drawing attention to it! Thank you for your comment. God encouraged me to take a different approach and focus on something other than being laid off. And I am glad I did. The journey has been a blessing to my family, our home and to me. This sounds great! I would be so excited to read it!